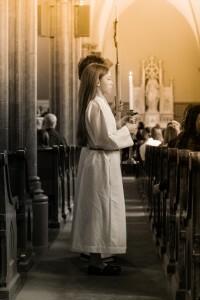 The role of the altar server is integral to the normal celebration of the Mass. At least one server always assists the priest and often two or more servers are present. They carry the cross, the processional candles during certain celebrations, hold the boo k for the priest celebrant when he is not at the altar, carry the incense and censer and assist him when he receives the gifts from the people, wash the hands of the priest, assist the deacon as necessary. Altar servers do not distribute holy communion. Altar servers wear albs and are seated in a place from which they can easily assist the priest celebrant and deacon. The place next to the priest is normally reserved for the deacon. Servers respond to the prayers and dialogues of the priest along with the congregation. They also join in singing the hymns of the liturgy. Training is held periodically. Servers receive proper formation, including instruction on the Mass and its parts and their meaning, the various objects used in the liturgy, such as their names and use, and the various functions of the server during the Mass and other liturgical celebrations.